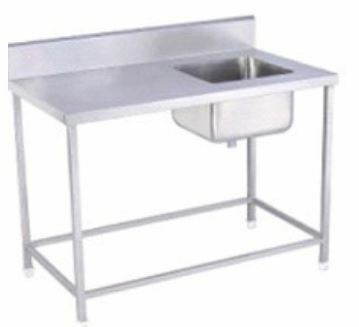 We are prominent firm engaged in providing best quality range of Single Sink with Table. These highly advanced stainless products are precisely manufactured for several commercial needs. Our professionals apply the most advanced techniques to provide them best finishing and design. We ensure reliable products with enough space and at the economical price range. Established in the year 2011, Skylark Kitchen Equipment is a leading enterprise engaged in Manufacturing and Supplying Refrigeration, Fast Food Equipment and Counter, Gas Range, Sink Unit, Rack and Table, Exhaust Hood, Juicer and Grinder and Display Counters. We design highly advanced products for cafeteria, hotels, sweets shop, restaurants, retail outlets and various other fast food centers. We ensure superior ranges of products with high performance, easy maintenance, advanced features, long sustainability and high reliability. With our broad industrial exposure and best clientele, we supply our products to various regions of the nation. We maintain decent business policies and focus on catering superior quality along with huge varieties.